I just received word from reliable sources about this year’s craziest steals yet on luxury eyewear!!! 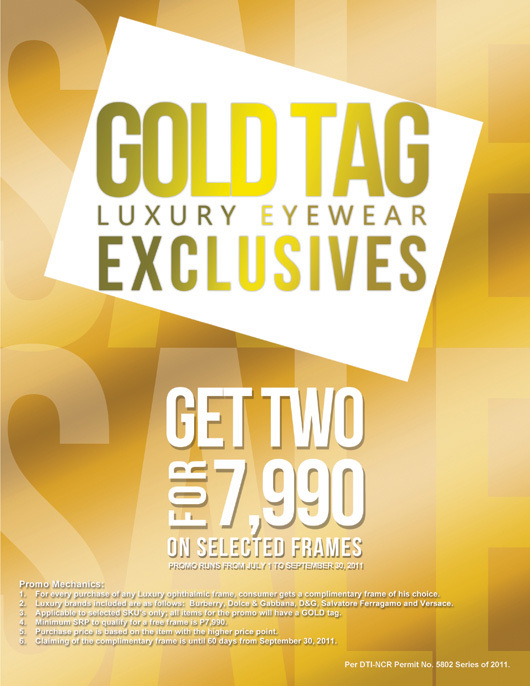 Participating stores for the Gold Tag promo are the following: Almeda Optical, (Shangri-La), B. Perez Optical, Eyecrafts (Eastwood Mall), George Optical, Goodvision (SM Megamall), LS Pascual Optical, Optical Spex (Greenbelt 5), Optical Works, Sarabia Optical, Shades & Sights, The Eyeshop Plus, The Optical Shop and Unique Vision Center. 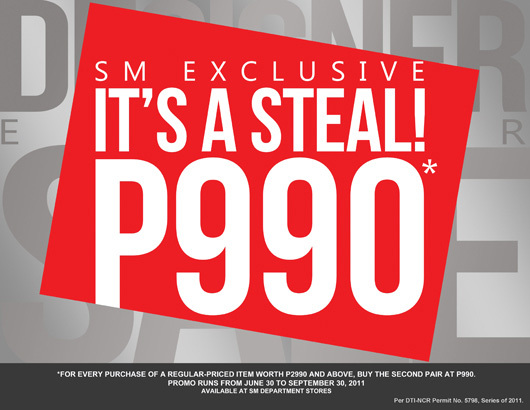 Buy any regular-priced eyewear worth P2990 and above at any SM Department Store, and buy the second pair at P990! Brands included in this promo are Salvatore Ferragamo, CK, Pepe Jeans, Versus and Vogue. Still not satisfied? Aside from these promos, there’s also an ongoing designer eyewear sale on selected brands in the stores too, wherein you can save as much as 50% off on sunnies! These promos and sale will run until September 30, 2011 only. So hurry and rush to participating stores near you!